The worst thing that can happen while you run or develop your store is to lose data and have to start all over again or re-install the application. To avoid this and especially before making a big change we recommend you to backup your store’s data. 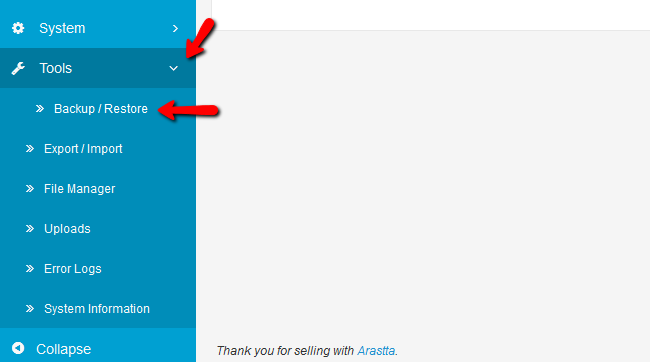 In Arastta you can do that from the store itself without having to go to cPanel and exporting the database. To create a backup of your store’s database you will need to enter in the admin area of your account and access the Tools>Backup/Restore section of your main admin panel. You will now have the backup/restore manager on your disposal. Here you can choose exactly which data from the database you want to backup. We recommend you to select all and click the Backup button. You will be prompted to save a backup.sql file of your database on your local computer. This file is your store’s entire database so keep it safe. If you want to restore your website from an available backup you just need to click on the browse option, select the file from your local computer. Now click on the Restore button to initiate the restoration process. After 10-30 seconds depending on your database size you will receive a green message confirming the successful restore of your database.